Most ESCs have a Battery Eliminator Circuit (BEC) inside that is designed to route some of the main battery pack power to the receiver, allowing you to eliminate the need for a separate battery pack for the receiver. The power is back-fed (typically 4.8 – 6 Volts DC) through the radio communication cable so signaling and power is all contained in the same three wires. BECs are a great weight saver and make getting ready for the field less complex by only having to charge the main pack for the aircraft in order to fly. Many older planes have been laid to rest because the pilot forgot to check the radio pack charge and lost the signal once they were in the air. 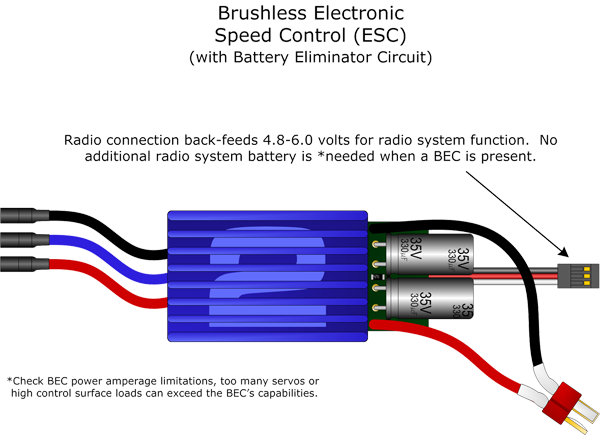 BEC Circuits have a maximum amperage rating for power supplied to the receiver. If you have stiff control surface hinges, sticky linkage, are using a lot of servos for separate ailerons, flaps, landing gear, etc, or are using digital servos you may exceed the BEC amperage supply and cause an under voltage condition or mini-brown out to your receiver. Even smooth, resistance-free servo operation can experience heavy loads while in flight due to wind resistance and cause a plane that operates great on the ground to fail in flight. Digital servos draw more current than analog servos so larger helis and aircraft typically run a separate BEC with a higher amperage rating or even a separate battery pack dedicated to the radio receiver. Check the amperage rating of your ESCs BEC output in the specifications documentation and start subtracting the max current draw specifications for all of your radio components (receiver, servos, lighting, etc.) and see what you get. If you are under the supplied amperage from the BEC using maximum ratings for all these devices, then you should be fine. The main motor is disengaged and the pilot is immediately aware that his main battery is at minimum safe voltage. This ensures that the pack is protected from excessive discharge that can permanently damage the cells. The cutoff at minimum voltage also ensures that the radio will have ample power supplied by the main pack to let the pilot land the aircraft instead of letting the voltage drop so low that the receiver loses connection and the plane crashes. Your receiver needs an average minimum of 3.5 Volts to operate properly and maintain a connection to the transmitter (check your receiver’s specifications – this minimum requirement varies between products). Once you fall below this voltage, the radio will either go into lock-out (PCM and 2.4GHz radio systems) or start dropping or “glitching” (PPM and FM radio systems). The new 2.4Ghz radio systems are not immune to lockout and while they offer tremendous benefit over FM/PCM radios, they can lock-out for at least one to a few seconds! Two seconds isn’t too bad when you’re sitting on the ground but in the air it is a lifetime. ESC’s for fixed-wing applications default to Battery Cutoff enabled, typically. Always use it! Helicopters are another story. Losing the main motor on a helicopter means you’ve entered a controlled crash…at best. So, heli ESCs typically have the cutoff disabled and the use of a low-voltage LED indicator is usually used to signal the pilot that the battery is getting low and it’s time to bring it in. Otherwise, without a separate low battery indicator, you are dependant upon hearing the motor pitch change and the heli to feel mushy or sluggish. Personally, I ALWAYS use a main battery low voltage indicator on all my helicopters and even most of my planes. I’d rather have enough battery left to keep the prop turning on my planes all the way to the ground and into the hangar. 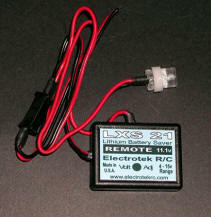 LXS 21 Programmable Low Voltage Indicator by Electrotek R/C. Adjustable from 4-15 volt indication. Watch when you have a single main pack supplying two ESCs. There is no logic shared between the two separate ESCs for both circuits to cutoff in sync and keep your voltage safe. I’ve personally experienced a problem with a twin engine setup when I ran the battery pack down to cutoff. One ESC would disengage, then both, then they would re-arm at slightly different times so my twin quickly became a random single. It was a lot to handle on the final approach! Either install a low voltage indicator, add a second main pack, or be conservative on your flight times. 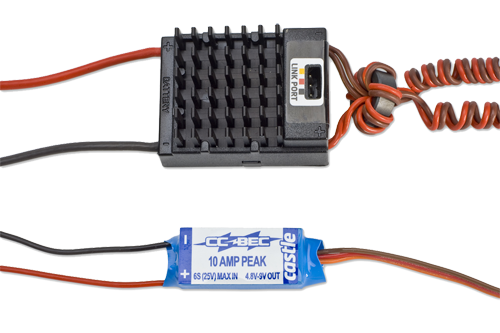 For large model setups, High Voltage ESCs, and models that have too many servos for their integrated BECs power capabilities, there are external BECs. External BECs range in supply voltage and amperage and offer rock-solid reliability for your radio system’s power needs. Many multi-engine setups use external BECs for reliability because the aircraft are typically larger and have higher radio system power demands. Internal BECs are usually limited by the input voltage so while your ESCs BEC may work fine with lower cell counts, it may become automatically disabled as you increase the cell count (and voltage). Always check your ESCs internal BEC capabilities to determine whether or not you’ll need to utilize an external BEC for your setup. Another reason for using external BECs is for preservation and isolation of your main flight pack(s) from the rest of your system. For example, many electric helicopters larger than 450 class use external BECs and separate supply battery packs. The BEC can regulate, say, a 7.4V lithium pack down to the necessary 4.8 or 6V radio needs without drawing from the main flight pack. Large aircraft can draw several amps so an external BEC and a large radio battery pack may be necessary for your giant scale aircraft as well. This page was last edited on 11 January 2013, at 23:52.